I love this page, the design, the colors and the "messy-ness" of it. 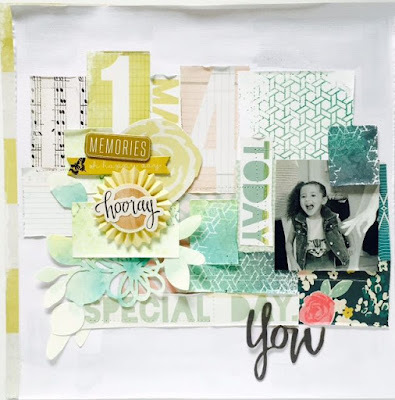 I just had to scrapbook after seeing this one and jumped in to my scrap-tin. I picked my scraps and placed them in some sort of color order, cold to warm but without thinking to much of it. Blue to yellow to pink, but I wanted to yellow to be a bit more. The title and flowers are Maggie Holmes "Open Book" and work so well whit the other yellows on the page. But my favorite part of this is the stitching, I love the subtle effect it gives and the it sort of pushes all of the patterns a step back. It took time, I won´t lie, but it was so worth it! After I had stopped filming I felt that the background needed something more. (this is the danger whit leaving your layouts on your desk, they will never be "just right") Anyway, I decided to add some watercolor-look by the "packaging-technique" and distress ink in "pumic stone" and some teal spray. In the end I love how it turned out and will definitely to this technique again so thank you Kim! !